"To the best of our knowledge, these are the smallest optical waveguides ever created in polydimethylsiloxane, or PDMS," said research team member Ye Pu of École Fédérale de Lausanne in Switzerland. "Our flexible waveguides could be integrated into microfluidic lab-on-a-chip systems to eliminate bulky external optics needed to perform blood tests, for example. They might also deliver light for wearable devices such as a shirt featuring a display." As reported in the journal Optical Materials Express, the new optical waveguides are not only thinner than a piece of dust, they also exhibit very low light loss when used with certain wavelengths of light. A light-based signal can travel through the new waveguides for 10 centimeters or more before an unacceptable degradation of the signal will occur. The researchers made the new waveguides by optimizing laser direct writing, a microfabrication approach that creates detailed 3-D structures by polymerizing a light sensitive chemical with a precisely positioned focused laser. Polymerization converts relatively small molecules called monomers into large, chainlike polymers. The new approach does not require a photoinitiator, which is typically used to efficiently absorb the laser light and convert it into chemical energy that initiates polymerization. "By not using a photoinitiator, we simplified the fabrication process and also enhanced the compatibility of the final device with living tissue," Pu said. "This enhanced biocompatibility could allow the approach to be used to make implantable sensors and devices." The new flexible waveguides could also serve as building blocks for photonic printed circuit boards that use high-speed optical signals rather than electrical links to transmit data in computers and other electronic devices. To achieve a small optical waveguide that efficiently confines light, there must be a large difference between the refractive index of the material making up the waveguides and the surrounding PDMS. The researchers used phenylacetylene for the waveguides because, compared to traditionally used materials, it has a higher refractive index once polymerized. As an added benefit, it also can be easily loaded into PDMS simply by soaking the PDMS in liquid phenylacetylene. After soaking the PDMS in phenylacetylene, the researchers used focused ultrafast laser pulses to induce an optical phenomenon known as multiphoton absorption in which multiple photons are absorbed at once. Multiphoton laser direct writing produces much finer structures than one-photon processes because the volume of polymerization at each writing spot is much smaller. Using multiphoton laser direct writing also allowed the researchers to directly initiate phenylacetylene polymerization without a photoinitiator. They then evaporated any unpolymerized phenylacetylene by heating the PDMS. The researchers showed that this new approach could make flexible waveguides in PDMS that are just 1.3 microns wide. For the 650 to 700 nanometer spectral band, only 0.07 percent of the light transmitted through the waveguides is lost every centimeter. Optimizing the setup would likely allow fabrication of waveguides that are smaller than 1 micron, according to the researchers. The researchers are now working to improve the yield of the fabrication process by developing a control system that would help avoid material damage during laser writing. 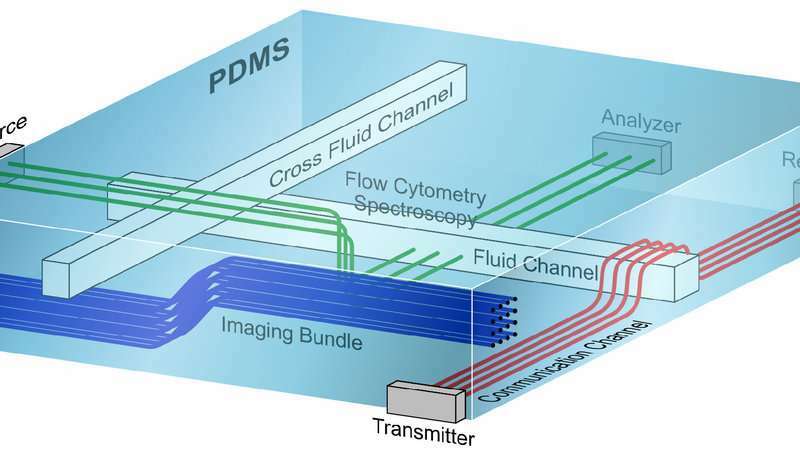 They also plan to create an array of narrow waveguides in PDMS that could be used to construct a very flexible endoscope with a diameter of less than one millimeter. "Such a small, mechanically flexible endoscope would allow a number of hard-to-reach places in the body to be imaged for diagnosis in the clinic, or for monitoring in a minimally invasive surgery," said Pu.